Preserving Seattle’s unique and diverse neighborhoods should be a top priority for Mayor Jenny Durkan and the city council. The state’s economic hub also needs to keep growing and providing more places for people to live. Both goals are achievable, if city officials work with rather than against neighborhoods. They must stop pushing the divisive upzoning proposals carried over from former Mayor Ed Murray’s administration. Murray’s “grand bargain” with developers is aging as well as a Thanksgiving casserole, but Durkan and the council are still shoving it down the throat of residents. Seattle’s growth struggles demand a new, inclusive approach. The city should start fresh with a neighborhood-by-neighborhood planning process, thoughtful of the opportunity, limitations and character of each. A recent ruling on the city’s Mandatory Housing Affordability (MHA) upzone plan — the core of Murray’s bargain with developers — highlights why this is necessary. A coalition of dozens of neighborhood groups challenged the plan, saying the city failed to adequately consider harm such as tree loss, displacement from new construction, congestion and overloading services and parks. City Hearing Examiner Ryan Vancil decided the city’s review of impacts was technically adequate. The decision should be viewed not as a green light, but an indictment of the environmental-review process and the city’s superficial, one-size-fits-all analysis of impacts. Had the city done a more detailed analysis, it “may have averted at least some of the deeply felt community concern expressed in nearly four weeks of hearing and in a hearing process that has taken the better part of a year,” Vancil wrote. This puts Durkan and the council at a juncture. They can press on with a three-year-old upzoning scheme disliked by many they represent and people most affected, including minority populations that may be displaced. That would fulfill Murray’s bargain with developers and appease affordable-housing advocates and labor groups pushing the plan. They would also be remembered as the politicians who took an ax to Seattle’s single-family neighborhoods. Or Durkan and the council can start over, end the fighting and build consensus for ways to accommodate growth without further harming places that make Seattle special. This would rebuild trust with neighborhoods where most residents live. It should be done anyway to take into account massive transit investments, which have expanded the metro area with fast and frequent connections to more housing and employment centers outside city limits. The city should reconsider terms of Murray’s MHA deal and who benefits most. It gives developers more capacity to build, with upzones and taller buildings. In exchange, they must provide some affordable units in their buildings or pay fees to a city housing fund. Since MHA began downtown and in several close-in neighborhoods, it’s fallen short of goals for affordable-housing production. That’s partly because of delays (enabling much of the Amazon building boom to avoid MHA fees) and because Seattle’s terms are so generous to developers, compared to other cities using MHA. The deal also disregards the high price existing residents will pay for a more crowded city with taller buildings and less green space. Such concerns prompted neighborhood groups to challenge Durkan’s effort to apply MHA citywide. The adverse impacts should really be considered in tandem with another Murray plan City Hall is enthusiastically pushing, to allow two or three rental units on virtually every single-family lot. 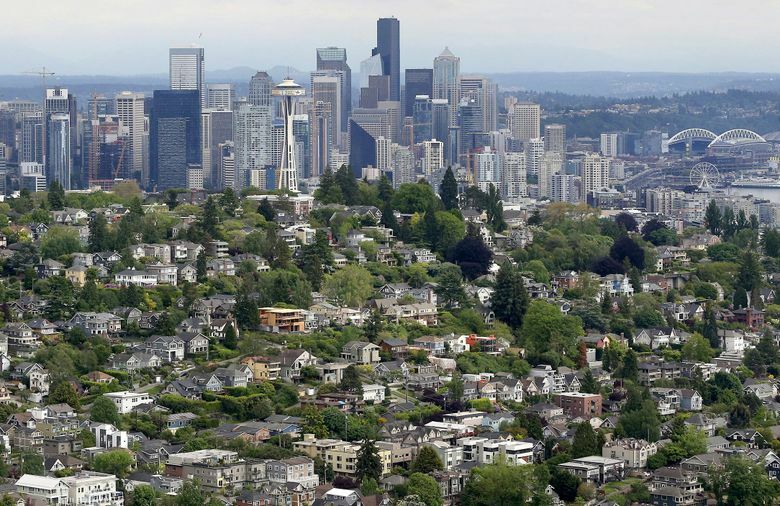 Together, these two zoning changes may bring about the demise of Seattle’s single-family neighborhoods. Durkan is excited to chart a course for Seattle’s future. But she must look beyond Murray’s old file cabinet for direction. She should also restore the stature of neighborhood councils that Murray sidelined. They suffered from years of City Hall neglect and were nuked after some took issue with his plans. There’s no urgency to pass Murray’s leftovers. 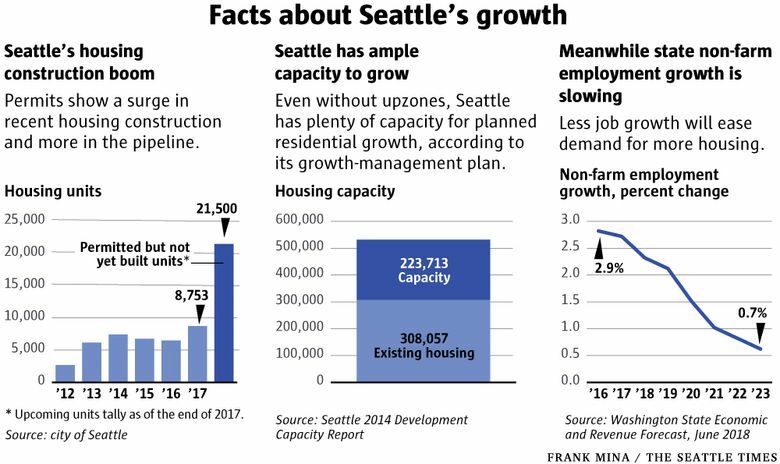 Even without upzones, Seattle has ample capacity for housing growth it’s expecting, according to its state-mandated development capacity report. The issue is not whether more housing can be added — it can and is already — but whether rules should be changed to squeeze more into profitable places to build. Meanwhile there’s been a surge of apartment and condominium construction, with even more in the construction pipeline, and rental vacancies are rising. Most were built within the city’s existing urban villages, which is what they were designed to do. Seattle’s supply of subsidized, affordable housing is also growing rapidly with local and state funding. At least 4,400 new units are expected to come online through 2021. Supply is tightest for single-family homes, but upzones will make them even more expensive, harder for residents to buy and more likely to be replaced with apartments. Seattle used to be a model of inclusive planning. Its formerly cooperative process created ample opportunity for growth while preserving single-family neighborhoods that are core to Seattle’s identity, community strength and competitive advantage. Current and future residents deserve thoughtful and truly inclusive neighborhood planning, not divisive grand bargains jammed through over residents’ objections.